Mobile usage is steadily increasing. Are you prepared? SAMSA has a team well-versed on mobile development, and understands the role current technology plays in today’s tech-advanced workplace. Increasing your organization’s mobile development opportunities, as well as application development and design, puts you at an advantage in the market and can help ease customer access while facilitating a strong relationship with your client. With a steady increase in mobile and tablet usage, your website needs to function properly on a wide variety of devices. Without an easy ability to access information, you’ll quickly lose site visitors or clients. By utilizing a responsive design, a site or application can be built as one entity and provide a friendly user experience regardless of how it is being accessed. Responsive design allows your website or application to be accessed on a wide variety of desktops, laptops, notebooks, tablets, and phones without hassle. Regardless of the device being used to access the site or application, the UI will scale and adjust to fit any screen on a modern browser. Navigation, images and text are adjusted to create a clean and user-friendly experience for any device. 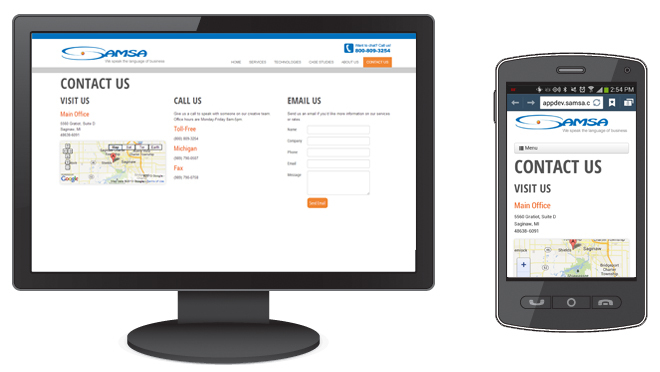 Utilizing responsive design allows your website or application to receive updates more efficiently. With a responsive design, there’s no need to update different versions of a a site or application. New content, additions and modifications only have to be applied once. Web-based mobile applications allow your business to rapidly launch solutions needed for employees or customers. Developing separate applications for iPhone, Android, and other platforms can be costly. With a web-based mobile application, all smartphones are able to access and use your application from anywhere. Updates, enhancements, and modifications are less costly as they only have to be applied once.